Public meeting of the Youth Services Committee prior to the CIT event. This interactive presentation is an introduction to mental health, designed to train both adults and youth on how to recognize warning signs of stress, anxiety, depression, and crisis. Join us every Tuesday morning from 10:00am to 12:30pm for our Mah Jongg and Board Game event here in the Flint Memorial Library Activity Room. Mah Jongg will be played and taught during the meet-up. Mah Jongg players of all levels are encouraged to drop in. You can learn from scratch or play join in with those at a higher level. In addition to several tables of Mah Jongg, some games–such as Scrabble and Monopoly–will be provided, but feel free to bring in your own board games to play during this event. The room is open to all and no sign-up is required. Come along and bring some friends! Join Miss Janice for this fun club filled with crazy and exciting activities designed to help students in grades 2, 3 and 4 code! Club runs for five weeks; registration is for all five weeks. This activity is for five students only. This book club is for those who like to try new recipes and meet new people. Prepare and bring a dish from any New York Times cookbook. Registration is requested. Join staff members from the Family Resource Network for 45 minutes of fun and learning. We will gather to sing, do a craft, read a book, bring out the parachute, or have a parade. This is a great opportunity to meet old friends or come and make new friends. Registration is not required. We will be discussing "Spies in the Family" by Eva Dillon. All are welcome to attend. Drop-in to chat with others about geneaology. Share stories and research strategies. Organize to effectively respond to the Trump administration's bigoted, corrupt and anti-democratic agenda. Author Cheryl Suchors will discuss her book 48 Peaks: Hiking and Healing in the White Mountains. Please join us for Cheryl's inspiring story of adventure and persistence. Copies of the book will be available for purchase and signing. More about Cheryl: despite her fear of heights Cheryl decided she would hike the highest of the grueling White Mountains in New Hampshire and eventually all forty-eight of them. In 48 Peaks, Cheryl endures injuries, mistakes, and the heartbreaking loss of a best friend. When breast cancer threatens her own life, she seeks solace and recovery in the wild. Her quest takes ten years. Regardless of her need since childhood to feel successful and in control, climbing teaches her mastery isn’t enough and control is often an illusion. Besides the White Mountains, Cheryl has hiked in California, Colorado, Maine, Montana, Massachusetts, New Mexico, New Zealand, Nova Scotia, Poland, Spain, Switzerland, Utah, Virginia and Washington. She’s a member of the Four Thousand Footer Club, the Appalachian Mountain Club and the Sierra Club. Cheryl Suchors is a proud graduate of Smith College in Northampton, Massachusetts and has an MBA from Harvard. After a successful career in management consulting, including becoming president of her own company she found the courage to launch her second career as a writer. Cheryl now lives in the Boston area with her husband and a plethora of plants. In their spare time they visit their daughter, travel, and engage in political activism. With her keyboard, finger plays and songs, Dara VanRemoortel is a popular visitor to our library. Get in on the preschool fun! No registration required. Sponsored by The Friends of the Library. Join us in the reading room on the 1st floor of the library for an Artist Talk with Jean Sariano. Jean's very colourful and attractive paintings are currently on display in the library for the month of April. There will be a reception afterwards at Cambia Davis's nearby home. No registration is required, however, RSVP is appreciated with Cambia at 617-817-5872. I will be teaching a certification class to new high school soccer officials. Informational community meeting regarding next steps on the 20 Elm Street 40B development and opposition strategy, as well as fundraising kickoff. Same topics as the prior weeks meeting but meant for people who could not make the first session. Meet the author behind the wildly popular series Who Would Win? Jerry Pallotta will meet fans and sign books at this special Children's Book Week event. Books will be on sale at 6 p.m. with the discussion starting at 6:30 p.m. Book signing to follow! Children of all ages may attend this session of Lego Club. Registration is not needed. 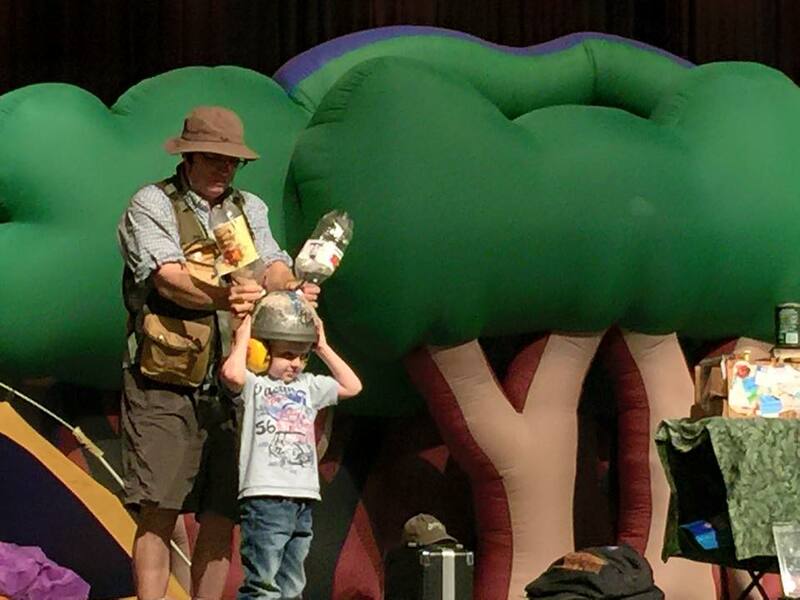 Join us for a spectacular Saturday event — Jungle Jim! Jungle Jim will present a Ballooniverse of Stories: A space-themed balloon magic show featuring rocket propulsion science, celebrating the moon landing, Star Wars Jedi Training and a 6-foot galaxy explosion! What to donate? Books in great shape that you would buy at a book sale for yourself, your family, or to gift– both adult and children’s. Very clean books especially wanted—both fiction and non-fiction. Books you loved and would like to share. College textbooks only. What NOT to donate? Books in poor condition, smelly, moldy, or heavily marked. Textbooks (except for college texts), encyclopedias, condensed books, CDs, VHS tapes, magazines, travel books more than 5 years old, computer books more than 2 years old. The Friends of the Flint Memorial Library appreciate the community’s support. Purchasing books at our book sale supports library programs, including children’s summer reading and special guests, technology, and museum passes not funded by the town’s operating budget. Join us for a hoe down with the Arthur Murray Dance Studio! Two certified instructors will hold a fun and easy group class teaching Patrons line dancing techniques and country dancing with a partner. This event is free and open to the public! All are invited to attend the Evening Drop-In Book Group. This month we will be reading and discussing Circling the Sun by Paula McLain. This book group meets the first Tuesday evening of the month unless otherwise noted. Stop by the Children's Room for this month's drop-in craft activity. Warning: Some craft activities may contain choking hazards. This is for Sunday, May 19, 2019. This book club is for those who like to try new recipes and meet new people. Theme is TBA. Registration is requested. Special agent Michael McGowan will visit the Flint Memorial Library to discuss his experience working more than 50 undercover cases and Ghost - My Thirty Years as an FBI Undercover Agent. GHOST film rights have been optioned to Sylvester Stallone's production company, Balboa Productions, for a feature film! Book signing and Question + Answer session will follow author's presentation. This event is free and open to the public - registration is requested. Thank you. NORCAM hosts a new & free screening series with the Flint Memorial Library called Cinematic Conversations! Every month, usually on the third Tuesday at 7pm, we are showing a new movie presented by a Boston-area critic who will then lead a post screening discussion. Friends of Flint Memorial Library open meeting. Annual potluck dinner and showing of the feature film Crazy Rich Asians. Join us as Boston Globe film critic Ty Burr visits the library to talk Alfred Hitchcock and other things cinema. Children & teens are invited to attend our annual Ice Cream Party/Summer Reading Kickoff event. Enjoy free ice cream while signing up for the 2018 Summer Reading Program! Sponsored by The Friends of the Library. Adult yoga - Rec. Dept. We will be discussing "A Gentleman in Moscow" by Amor Towles. All are welcome to attend. 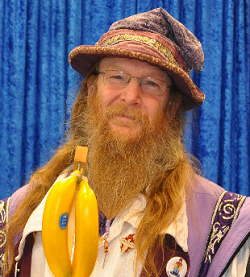 Join us as we kick off this year's Summer Reading program with a special "Reading is Magic" performance with Ed the Wizard! Inspired by Dumbledore, Ed the Wizard used his library to become the amazing wizard he is today. A fun, energetic show that needs lots of volunteers, this will be a great way for us to start our Summer Reading program! Sponsored by the North Reading Cultural Council. All are invited to attend the Evening Drop-In Book Group. This month we will be reading and discussing A Wrinkle in Time by Madeleine L’Engle. This book group meets the first Tuesday evening of the month unless otherwise noted. “Through the solar system and beyond!”… is exactly where Dinoman takes his audience in this fast paced exploration of the heavens. The eight classical planets are visited and investigated—as well as Pluto, gravity, and the incredible cold of space. Dinoman Space uses dinosaurs, meteors, comets, liquid air, and a goldfish to give students a truly unique view of the heavens. Join us for a Baby Animal Petting Zoo with Animal Craze!! Animals may include a lamb, two baby goats, a piglet, 6 to 8 chicks, 4 to 6 ducklings and 4 to 6 baby bunnies. Sign up for a 15-minute session here - http://bit.ly/babyanimalpettingzoo. Howl at the Moon with a Wild Thing Tune! 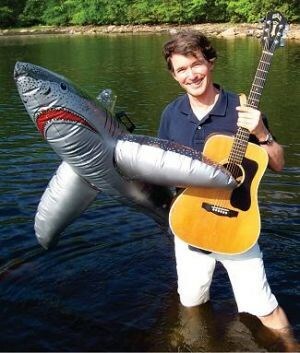 Join New York musician Tom Sieling for an energetic, participatory event filled with popular kids songs! Tom includes facts all about animals and space during this fabulous performance. We will be discussing "Killers of the Flower Moon" by David Grann.. All are welcome to attend. Learn all about butterflies, bees, bats and important critters that help pollinate our orchards, back yard gardens, and our rain forests. Audiences will learn how to build and maintain habitats that help our pollinator populations, what time of year to mow fields that is most beneficial to pollinators, and what flowers to grow in our gardens to attract butterflies and bees! You'll also create pollinator T-shirts, using a combination of fabric dye sprays, plants, and butterfly, bat and dragonfly cut outs. Children may purchase heavy cotton (Gildan) tee shirts for $4.00, or bring their own. The Flint Memorial Library "house band" Rolie Polie Guacamole is BACK! Patrons and staff alike are thrilled to welcome Frank and Andrew of Rolie Polie Guacamole back to the Flint Memorial Library Activity Room for another rousing performance of their greatest hits. The fun begins at 3 p.m. Bring your dancing shoes and your singing voices! All are invited to attend the Evening Drop-In Book Group. This month we will be reading and discussing Little Fires Everywhere by Celeste Ng. This book group meets the first Tuesday evening of the month unless otherwise noted. Today is the final day to enter for Topsfield Fair tickets. While Summer Reading is open for all readers age 0 to 18, Topsfield Fair tickets are only available for students going into Kindergarten and Grades 1 through 6. This is determined by Topsfield Fair, not the Flint Memorial Library. Today is the final day for Summer Reading!